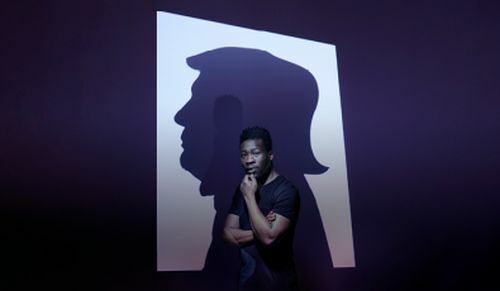 The concept of Britain and our relationship with our nostalgic past is something many playwrights are eager to unpick and has been of particular interest since the divisive Brexit vote last year. Even before that writers like Alan Bennett had considered our engagement with the heritage industry in his 2012 play People that examined how one stately home had to think of its future to preserve its past. 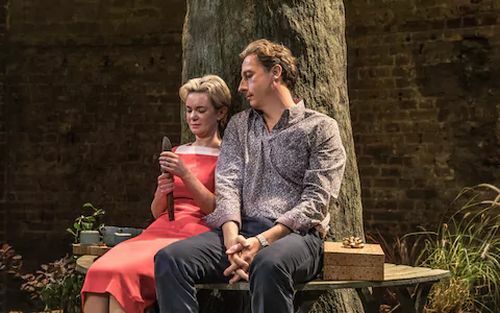 Now, Mike Bartlett is treading similar ground with his new play Albion at the The Almeida which charts one woman’s decision to restore and preserve a historic garden. Having penned the acclaimed Charles III which transferred to the West End and ended up as a BBC TV movie earlier this year, as well as the family melodrama Doctor Foster, Bartlett’s star is riding high and Albion is the first production in a new season at The Almeida after a highly successful year. On paper, then, everything should come together here, the right playwright, the right theatre and the hottest hot topic – how Britain’s hankering for a long-lost past is now affecting its political future – but while the play’s set-up is a good one and it begins well, somehow too many slightly unlikely leaps and a run-time of well over 3 hours means Albion just fizzles out. Set in the Red Garden of an unseen country house, Audrey has stepped-back from her successful London business and city life to return to her childhood home where she intends to restore the 1920s gardens to their former glory. While Audrey has dragged her long-suffering second husband and daughter to calcify in the country, her sense of purpose pits her against the village when she ends their access to the house. Controlling all around her, Audrey must deal with the girlfriend of her son who was killed in action two years before, her daughter’s absences, the expectations of the villagers who want work, all while trying to create something that honours the past and preserves it for the future. Divided into four acts, Bartlett’s new play suffers from an unsatisfactory second half and too many storylines that feel thin despite the excessive run-time. When did it become fashionable again for all plays to last for three hours or more? Nothing at the Almeida this year has finished before 10.30pm and, not disregarding the comfort of audience members with sore backs and trains to catch, the work almost never requires these lengthy performances. Ink aside, which was gripping and charming to the end, everything else would have been improved with a judicious edit, and Albion in particular needs a fair amount of cropping. The first two acts which last for 95-minute before the interval are the best part, setting-up a series of interesting discussions about the nature of grief, of memorialisation and the effect of war on those left behind. In addition, through Audrey, by far the most credible character superbly performed by Victoria Hamilton, avenues also open-up exploring mother-son relationships, the problem of city-dwellers moving halfheartedly into the country, the almost spiritual connection with the physical earth of England and a deep need in middle-age to rediscover your roots while guaranteeing your influence on the future. Despite a flood of four and five-star reviews after press night a couple of weeks ago and plenty of comments about the profundity of Bartlett’s state-of-the-nation family drama, it final 1hr and 20 minutes throws it all away with unconvincing situations and circular arguments. It’s difficult to explain why without revealing spoilers but an argument that plays-out just before the interval between Audrey and her friend Katherine, is revisited again in Act Three almost exactly as it was with little progression and telling us nothing new about the characters. Likewise, one of the biggest leaps of credulity involves the grief-stricken Anna, the girlfriend of Audrey’s deceased son who’d been with him for only 3 months when he died. Yet she easily takes an important step without any reference to the medical and legal complications, not to mention that enormous expense, that would have put significant if not insurmountable obstacles in her path, as similar newsworthy cases have proven. As Act Three rather laboriously turns into Act Four, you begin to wonder what is left to say, and when the end comes, none of the early promise has been satisfactorily delivered. All those topics Bartlett established so well are still there and it is packed with comment, but, like Against, the play becomes distracted from its original purpose with almost soapy plotting that undercuts the deeper purpose. There is a sense that the physical ground of England is somehow integral to the British soul, and like many war poets, Bartlett finds a romance in this idea but it doesn’t need three hours to come to fruition. One of the reasons to keep watching is a wonderful central performance from Victoria Hamilton whose sharp and unforgiving exterior hides a deeply emotional centre, a woman who without realising is channelling her grief into an elaborate project that is entirely bound-up with her new understanding of life’s unfair fragility. Everything about Audrey feels real, from the hard-nosed business woman who deliberately stepped-back from the company she started from scratch to pursue a more fulfilling life, to the mother and friend frustrated by the foolish choices she perceives from those around her. Where Hamilton excels is in making you understand that Audrey’s anger, interference and desire for control actually comes from fearing the long-term emotional consequences for her loved ones who will be permanently and regrettably altered by the things they’re doing. She’s not someone who is outwardly emotional, she resents any idea of expectation imposed on her and rails against it, but she does care and deeply about preserving and protecting all the fragile things in her garden. It is a really superb performance by Hamilton who dominates the show in the right way and exposes the paleness of the other characters. The best of these is Anna (Vinette Robinson) who is invited to the Red Garden but finds comfort in its peaceful environs and a connection to fallen soldiers that she is unable to leave. Her conflict with Audrey is only partially about her former partner and instead is more generally about the different perspectives on the past that the two women compete over. Despite a relationship of only a few months, Anna sees that period as having shaped her and with an importance that results in the unlikely scenario described above. And while it’s clear that Anna is forging her own link between past and future, quite distinct from Audrey’s, some of the devices chosen to express that – including rubbing soil between her legs – feel melodramatic and faintly ludicrous, especially as Robinson plays her as a remarkably sane woman. There are plenty of good performances among the rest of the cast even if their characters are little more than sketches. Helen Schlesinger is a calm presence as novelist Katherine, and while it’s hard to believe that she wouldn’t have given-up on Audrey’s one-sided friendship years before, there is plenty of angst to drive a major subplot. Similarly, Charlotte Hope as Audrey’s daughter Zara with literary aspirations plays with ideas of hero-worship and the university process of self-discovery that examines the choices of youth, while Nicholas Rowe’s Paul is a bored but supportive presence as the husband Audrey dragged somewhat unwillingly from the distractions of the city. There are also a series of servant-roles who give additional context but mostly serve as reflections on Audrey, who is frustrated by the ineptitude and perceived entitlement of local cleaner Cheryl (Margot Leicester), while continuing to employ her and more efficient Polish cleaner Krystyna (Edyta Budnik), a sign of the heart beneath Audrey’s brusque efficiency. Miriam Buether’s oval garden set in the ¾ round is charming, but two long sequences in which characters symbolically plant and tear up a series of flowers and shrubs around the perimeter may be loaded with meaning but they do protract an already long evening. Albion has a lot going for it and lots of things that it starts to say, but despite Victoria Hamilton’s wonderful performance, its length works against it. It becomes a little repetitive, de-prioritising audience comfort for an overly strung-out conclusion. Albion could get where it’s going a bit fast, it just needs a thorough pruning. For most theatres, a West End transfer is the Golden Ticket, the chance to take their work to that tiny patch of illustrious venues from Shaftesbury Avenue to Covent Garden. Sometimes these are a roaring success; the new transfer of Ink, such a joy at The Almeida, is every bit as perfect at its new home in the Duke of York’s, Andrew Scott’s Hamlet retained its lovely intimacy in the bigger Harold Pinter space and anyone who saw the Young Vic’s A View from the Bridge in any venue couldn’t help but be astounded by its impact. But a transfer is also a gamble, and every year numerous plays fail because the decision to open the performance to new audiences is predominantly a commercial one, with artistic drivers taking second place. There are three main types of West End transfer; the ones that move within London from the high-performing venues that attract the mainstream critics, best described as “off-West-End”; there are regional transfers from the powerhouses of the Theatre Royal Bath, the Bristol Old Vic, the Chichester Festival Theatre, the RSC in Stratford and the like; and there are the shows that come from Broadway. The latter two categories seem to suffer more often in the glare of the West End, partly, as Lynne Gardner recently pointed out because a 5 star show from Edinburgh feels very different when you put it in London, and partly because transfers are too often a poor fit for their new space. Crucially then, context is all. Ink and Hamlet may have successfully sidestepped these problems, and arguably off-West End transfers fare better because they’re in front of exactly the same set of critics as their original run, but not all of them succeed. This year the Menier Chocolate Factory’s production of Love in Idleness proved a sell-out at its tiny London Bridge home and critical applause meant a transfer was inevitable. Yet, when it finally landed at The Apollo, it’s evident original charm felt a little lost on the bigger stage, playing to a less than full house on a Friday night. Likewise, plaudits rained in for the RSC’s production of Queen Anne in Stratford but although the story was interesting enough and well performed, in the less-than-full auditorium of the capacious Theatre Royal Haymarket (TRH) on another Friday night, it felt meandering and stilted. Last year’s Alan Ayckbourn revival of How the Other Half Loves also fell foul of the TRH effect, drowning its comedy in acres of space. Perhaps the critics don’t notice from the visual comfort of the Stalls, but siting in the Upper Circle or Balcony the action felt more remote than it should. Yet, it’s not always this way and plenty of shows manage to play as effectively to the top of the house as to the bottom, so what is happening? The answer is that too often shows are transferring kit and caboodle, without taking the time to think about how they fit into their new space. Transfers can happen months after the original run, by which time the Director and Designer are on to other projects, but without more considered input into how the show will play in the new space, you end up with reams of discounted seats. It’s no surprise to hear that you could barely get into Hamlet at the Harold Pinter but the TRH were practically paying you to see Queen Anne in its final weeks. Shows fail to dazzle in the West End for other reasons of course and perfectly decent productions of well-known plays with star names can represent some of the very best work in their region. But with just so much choice, so many approaches to performance and younger theatres pushing boundaries, some of these transfers can seem a little too safe, traditional and even old-fashioned. When London theatre-goers are offered the choice of seeing the umpteenth version of Hay Fever or The Importance of Being Ernest with a star of yesteryear, or Ivo van Hove, Jamie Lloyd or Robert Icke deconstructing an equally classic play and blasting new life through it, its innovation that usually wins. The same applies to Broadway transfers, like this year’s The Mentor for example, which in many ways play much safer than London shows and don’t always achieve the same level of critical appreciation they had in the States. The point of all of this is to show that a West End transfer is not an end in itself, and the shows that do well have to earn their audience in exactly the same way as any new play opening in WC2. There are soaring successes that can equally come the few miles across town, from across the country or across the pond, but they work so well because they pay attention to their new context, to a different size stage, to a theatre with multiple seating levels and to the audiences hungry for interesting stories told in exciting ways. Recently, the American Repertory Theatre production of The Glass Menagerie made a spectacular impact at The Duke of York’s, Ian McEwan and Patrick Stewart’s toured in No Man’s Land before finally arriving for a triumphant run at the Wyndhams late last year, while Oslo is doing great business at The National Theatre and is sure to triumph at the Harold Pinter as well. Within London, shows of incredibly quality have also earned their place in the West End; who hasn’t been impressed by The Ferryman which came from The Royal Court, and re-watching Hamlet at the Harold Pinter last month, the production had matured beautifully from its original Almeida run, retaining its intimacy, as if Andrew Scott was holding you hand and whispering his soliloquies into your ear, a private excoriation of soul between you and him. This is the context then for the transfer of James Graham’s fantastic new play Ink which received its Golden Ticket to the West End after a sold-out and highly acclaimed run at The Almeida from June. Seeing it back then, it was instantly clear that Graham’s work was a masterpiece, a perfectly constructed piece of theatre that months on is still worth gushing about. Happily, every word of this original review still stands and it’s transfer not only provided another opportunity to see it, but, with enormous competition, proved that so far it is undoubtedly this year’s best new play. That banner has already been handed to The Ferryman, which in a big year for new work set a high bar, but although excellent and expertly directed, didn’t quite hit the emotional pitch or degree of darkness that the early scenes implied would come. 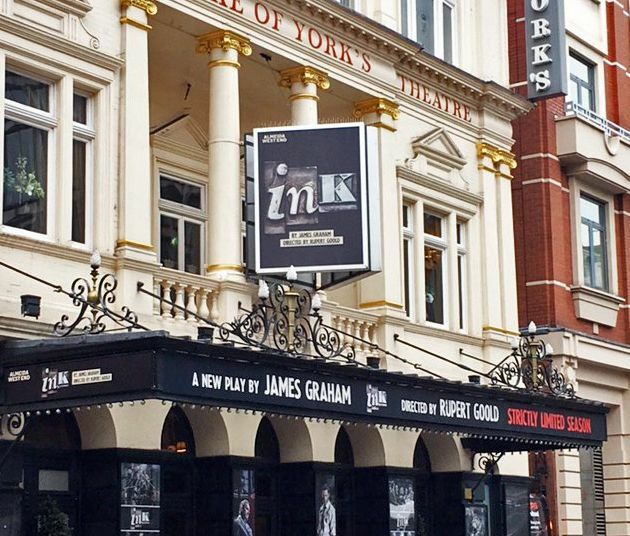 Even with promising shows like The Network and Graham’s own rival new play Labour of Love still to come, Ink is an extraordinary piece of writing that has easily made the leap into West End history. With almost the entire original cast still onboard, the show’s elaborately staggered design by Bunny Christie looks like a seedy den of journalistic compromise with desks and cabinets piled high, and feels like it was built especially for the Duke of York’s, so snugly does it fit the stage. It’s video screen backdrop plays host to Sun headlines from its first year of operation, as well as indicating scenes set at other newspapers, and offers a trail of dripping ink as the mood darkens, which seems more noticeable than it had been at The Almeida, adding much to the changing tone. A second viewing means the story is familiar so there’s plenty of time to enjoy all the subtleties of director Rupert Goold’s production and the extensive research that shines through the writing. The opening scene, two men spotlight from the back, feels more like a deal with the devil than it did before, while Goold brings out the growing sense of camaraderie that Sun Editor Larry Lamb builds from scratch among his team of Working Class outsiders, showing how that team ethos was a driving force behind the success of The Sun in the early months. But crucially, although they stand together in the good times, in the second half when things take a darker turn rifts develop among them, based on taste, and slowly the play devolves into a series of smaller and smaller conversations until Lamb is alone onstage once again, isolated by his own choices. Richard Coyle’s Larry Lamb is every bit as repellently fascinating, sympathetic and hateful as it was earlier in the summer. In Coyle’s performance Lamb is the embodiment of The Sun, a traditional fleet street man turned on his head by the populist cavalcade he unleashes. Initially reluctant, Lamb becomes the leader he needs to be to make his mark on the clubbable world of Fleet Street, and Coyle shows him unleashing a monster as he seeks the next sensationalist headline that will ensure he meets his target of outselling his rivals. Bertie Carvel’s Rupert Murdoch is equally fascinating, a slightly twisted sliver of darkness that sets in motion the biggest sea change that journalism had ever seen, but manages to keep culpability at arm’s length. It’s a very physical performance, with a slight stoop and way of holding his head to the side as he rails against the Establishment that won’t ever accept him. One of the most intriguing aspects of Graham’s characterisation is seeing this aspect of Murdoch, the innovator who brings business-thinking to the newspaper industry, modernising its approach but all the while knowing the audience will understand the consequences so many decades on. With many of the cast members reprising their original roles, there is an excellent support for the leads which ensure this remains a fantastic ensemble piece with not a character wasted, each one adding layers to the drama and background to the newspaper business that made The Sun’s approach so radical. There are great supporting performances from Sophie Stanton as formidable Women’s Editor Joyce Hopkirk who holds her own in a world of men, Justin Salinger as Brian McConnell the crime writer turned right-hand-man to Lamb, one of the lads who fears the paper’s direction, and Tim Steed as the buttoned-up Bernard Shrimsley whose love of fonts adds much hilarity. Ink has made the most of its Golden Ticket to the West End and remains one of this year’s most unmissable shows. Happily situated at the Duke of York’s, the staging fits the space entirely and the multi-level aspect of the set plays to all the theatre’s seating levels. Beautifully constructed and superbly performed, Graham’s play is a fascinating insight into one of Britain’s most important industries and the period that set it on a new track. Getting a West End transfer right may be a huge gamble, but by prioritising the artistic transition toits new home, Ink shows how it should be done. And that’s one bit of news that isn’t fake. Every now and then a theatre will have a run of particularly good form, as show after show manages to earn critical and popular acclaim. It’s fair to say that The Almeida is currently enjoying a very purple patch, with a series of big successes over the last six months to which they can now add their latest production, James Graham’s new play Ink. The Almeida’s luck began with Mary Stuart in January, and although I didn’t much care for it, it wowed the critics and has just announced a West End transfer, following in the footsteps of its impressive Hamlet starring Andrew Scott that has just opened in the Harold Pinter. Equally excellent was the wonderfully bizarre world created by The Treatment, and with Ben Wishaw starring in Against in August, The Almeida’s mix of classics and new writing, established stars and fresh talent is delivering an astonishing season of work. With press night for Ink on Tuesday it will be interesting to see if this continues the run of critical approval for the theatre, especially given that its subject – the birth of the current incarnation of The Sun newspaper and its deliberate attempt to shake-up the cronyism of Fleet Street – might ruffle a few critical feathers at the very newspapers it mocks. That aside, it was perfectly clear even at the preview that this is one of the not-to-be-missed shows of the summer, a hilarious, pointed and nuanced examination of the tabloid press and the two men who brought it into being, Larry Lamb and Rupert Murdoch. It’s 1969 and the young Rupert Murdoch is negotiating a deal to buy the ailing Sun newspaper from The Mirror group, and tries to convince Yorkshire-born editor Larry Lamb to leave his regional paper and return to Fleet Street to oversee The Sun. Given a target of one year to increase the newspapers paltry market share from hundreds of thousands to millions, Lamb sets about reinventing the modern tabloid with give-aways, bold headlines and reader-focused content. As Lamb’s team try to top The Mirror’s circulation numbers, they start to make choices that will compromise their original ideals, upset “the street” and invent a more sullied style of journalism. James Graham has become quite adept at revealing how various parts of the Establishment fit together and 2017 is proving a good year for him too. A revival of his 2012 play This House was warmly received in the West End and another new play, Labour of Love starring Martin Freeman and Sarah Lancashire, opens at the Noel Coward in September. Best described as a comedy drama, Ink is a joy from start to finish and considerably more balanced than you’d imagine a play about the origins of a tabloid newspaper to be. What is clear from his style of writing, is that Graham wants you to understand the human motivations behind our modern impression of The Sun and its founders, how it became the behemoth it is today by taking us back to its origins. In the creation of character, Graham deliberately avoids cartoonish ridicule, but offers a chance to reflect on the original ideals of Murdoch and Lamb, using their outsider status to create innovative disruption in the industry, and believing that they were delivering an individual-focused people-led newspaper that spoke to the working nation in a way that broadsheets couldn’t. What is so fascinating about Ink is the idea of the Frankenstein’s monster they all created by playing to these notions which then began to take on a life and momentum which they could no longer control, warnings about which are echoed repeatedly – and it is this, along with the race for circulation, this is the backbone of the play. Richard Coyle leads an excellent cast as the change-maker Larry Lamb, who seems to trade attitudes with his new boss Murdoch, played with relish by Bertie Carvel, as the play unfolds. What begins as an us-against-the-world partnership as the northerner and the Australian try to break the clubbable stranglehold of the elite on mainstream British journalism, becomes a more fractious relationship as Lamb takes outrageous risks that Murdoch squirms away from. And in the central section of the play, Murdoch is seen less and less as he steps back from direct engagement with the paper to develop his much wider media empire, leaving Lamb to call the shots and take the fall if it all goes wrong. Coyle is such an accomplished actor and not often enough seen on stage or screen, but here is the driving force of the play. What we know about Lamb in retrospect and the cost of his interventions will send you to this play with considerable pre-conceptions, which Coyle skilfully subverts. Instead we are introduced initially to a good man, solid, reliable and with a talent for bringing his staff together harmoniously, but even in his first scene we see the seeds are sown as he outlines the 5 whys of good storytelling – who, what, when, where and what next, having abandoned why because it doesn’t matter. He also has a slight chip on his shoulder about lack of promotion when he worked for The Mirror but he ploughs his frustrations into making The Sun a reader-focused newspaper full of the things Brits love with very little hope of turning the papers fortunes around. But as the story develops, initial success goes to his head and Coyle demonstrates how Lamb became increasingly reckless, discarding decency and taste to reach his one-year target to outsell all their rivals, even using the personal tragedies of his own staff. Murdoch has to push Lamb to become a businessman, taking tough decisions at the expense of friendly relations with his team, but when he does there’s no one to hold him back. And in the final moments of the play when Lamb sees the consequences, Coyle brilliantly conveys a sense of hopeless regret and anxiety about the future he has been instrumental in creating. Bertie Carvel has to bear the weight of even more expectation as the young Murdoch, espousing Thatcherite ideals of individualism and big business a decade before she became Prime Minister. Carvel captures the soft accent and slightly hunched physical demeanour extremely well and works hard to keep Murdoch on the right side of caricature. It’s clear he resents his outsider status, looked down upon for his background and connections by the owners of Fleet Street’s finest, but he clings to a new business-focus that chimes with the changing attitudes of the late 1960s, despite his instance in dining at the exclusive Establishment restaurant Rules. Perhaps most intriguing is how clearly Murdoch distances himself from some of Lamb’s innovations, and Carvel plays this as part hesitancy, part washing his hands of it, so by the end of the play you see clearly the man he would become. Surrounding the leads are a fantastic team of reporters and production staff including excellent turns from Sophie Stanton as the chippy Joyce Hopkirk a no-nonsense seen-it-all Women’s Editor in a world of men, Tim Steed as Bernard Shrimsley the paper’s only well-spoken posh Brit with a love of fonts (who in real life became Lamb’s successor), and Justin Salinger as crime reporter turned unofficial floor manager Brian McConnell who becomes Lamb’s right-hand man. There are great smaller roles for Pearl Chanda as young model who becomes the first Page 3 star, David Schofield as Lamb’s former mentor Hugh Cudlipp and, channelling the sartorial style of Robin Askwith in Bless This House, Jack Holden as long-haired young photographer Beverley. Bunny Christie’s towering design feels like a rat trap with desks piled on top of one another, clutter and paper everywhere and various exits and pathways. It has the look of a busy newsrooms but also the poorly conditioned basement implied in the text. The set does have several levels and if you’re at the back of the stalls you won’t be able to see more than the legs of the actors at the top due to the overhang of the circle, but the majority of the action takes place on the main stage level. Director Rupert Goold keeps the action moving swiftly and scenes merge effortlessly using the various levels and sets raised into place from the floor. Goold also keeps the balance between comedy and a much darker second act, alongside moments of pure whimsy as short song and dance routines act as a montage for Lamb collecting his team, and later the unbelievable success of The Sun’s early months, all beautifully lit by Neil Austin. 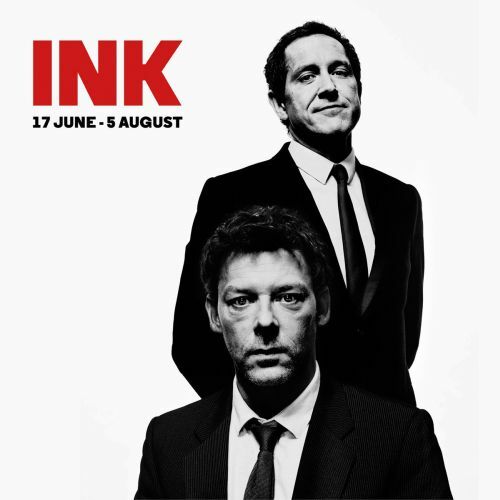 Ink is one of those rare plays that you watch with a smile on your face throughout, not just because it’s funny, but because the writing is so engaging and the performances so accomplished that you’re gripped by what it has to say. The Almeida really is enjoying the purpliest of purple patches and Ink really deserves to be headline news. Richard III may well be the most frequently performed Shakespeare play of the last few years, seemingly spawning more productions than Hamlet. Given a new lease of life after the discovery of his body in a Leicester car park in 2012, we’ve seen the lead role played by Kevin Spacey at the Old Vic, Martin Freeman in a Jaime Lloyd version, a wonderful promenade production by Iris Theatre Company in St Paul’s church yard and Mark Rylance at the Globe. The Faction opened 2016 with its innovative version at The New Diorama starring Christopher York and a few weeks ago the BBC screened its version with Benedict Cumberbatch. Now at the Almeida, Ralph Fiennes assumes the role of Shakespeare’s most controversial villain. Fiennes is having an incredible run of form on stage; he’s taken on three mammoth roles in major productions with a combined stage time of well over 11 hours. Starting with Man and Superman last year at the National, The Master Builder at the Old Vic in February – both shamefully overlooked by the award panels – and now Richard III for the Almeida; it’s an impressive commitment to theatre that in little more than a year has been incredible to watch. This performance feels like the end of a trilogy of works that have examined the ambiguous nature of power and its ability to release the inner strands of villainy and self-absorption disguised by a charming manner and degree of the subject’s star power. While Man and Superman’s John Tanner was the least dangerous, his vanity led naturally into Fiennes next role as Ibsen’s Halvard Solness the eponymous master builder who sacrifices everything for fame, and ultimately then to the dark and dangerous charisma of Richard III who covets greater status and will do anything to get it. The Almeida’s production opens with the archaeological dig in that Leicester car park with forensic officers searching for remains in an open grave where they find the skull and curved spine of Richard. It’s a poignant opening that references both the ongoing contemporary interest in Richard’s story, and Shakespeare’s own version of it, as well as the burden of mortality which hangs heavy over this interpretation. Though mostly covered in a retractable glass platform, the grave is visible throughout reminding the audience that Richard will cause many deaths on his path to the throne – and reversing the soldier-ornaments concept from And Then There Were None, skulls appear on the back wall with each fatality – but also that for all his machinations this too will be Richard’s own fate. In an interesting directorial decision, at key moments the glass is retracted and characters move around the open grave and occasionally die into it implying perhaps that these decisions seal Richard’s own fate. It’s a contemporary design using a palette of sombre black to reflect the constant mourning of the court, with touches of monarchical gold. Jon Morrell’s costumes and Hildegard Bechtler’s set offer a modern yet timeless element to the story, combining a minimalist simplicity with hints of cold stone palaces and Midlands battlefields. A swinging chain mail curtain separates the throne from the grave, a potent symbol of the role of war in the creation and destruction of medieval monarchy which reflects the play’s own concern with the grieving royal widows whose fortunes were decided in combat. More perhaps could be made of the military influence on this society in other areas of the design to really emphasise the years of brutality, suspicion and devastation that have afflicted Yorkist England. Fiennes’s Richard III is a monstrous combination of magnetism and psychopathy that wins the audience’s interest early on. He begins by letting us in on his plans and as he wheedles his way towards the crown, his methods become increasingly dangerous and sadistic. But charm comes first and as we see in only the second scene language is his initial tool to convince the Lady Anne to marry him and then winning the various council members to his will. Later still we see his physical strength that despite his deformity, is sufficient to overpower and subdue Anne and Queen Elizabeth as well as prove a worthy opponent in battle. The curved spine held up by the archaeologists at the start is mirrored in the prosthetic Fiennes wears which makes the ridges of the backbone occasionally visible through his costume. His right arm is clamped to his side, the left shoulder built up and one foot slightly turned in, but this is no panto representation and Fiennes absorbs Richard’s deformity into a fuller perspective of the character – Richard rarely draws attention to his differences and Fiennes subtly uses that to imply the powerful way in which Richard sees himself, as the same or better than other men. The intensity of performance is a joy to watch and each of his soliloquies are magnificent; he has a great feel for the verse and a stage presence that creates a very different energy and vitality when he’s there. Fiennes in full flight is really something to see, and as his Richard explodes with anger and recrimination, as well the more sensitive and troubled moments of conscience, it’s thrilling to immerse yourself in such a high calibre performance. A number of other actors also stand out, particularly Finbar Lynch as Richard’s co-conspirator the Duke of Buckingham who helps to work the council and arranges a few deaths that propel Richard to the throne before bulking at the murder of the Princes. Scott Handy has a sensitive and moving role as the innocent Duke of Clarence, Richard’s brother and first victim that provides a stark contrast with our protagonist, while Aislin McGuckin is a fiery Queen Elizabeth who charts the descent from ultimate power to destruction really well. Her lengthy scene in the second part of the play with Fiennes in which he persuades her to let him marry her daughter is one of the best in the production, full of tension and bitterness that builds to what will be a controversial climax, although one which brings fresh perspective to this scene and will be a talking point on the way home. With five shows under its belt, the Almeida’s production is still in preview so a lot can still change, and with three further performances before Thursday’s press night there are a few things the show could do to make even more of an impact. Shakespeare’s Wars of the Roses plays have a huge cast of characters to keep straight so it’s easy for an audience to be confused by the various Dukes and members of the clergy, and too often in the group scenes a lot of characters are dotted around the stage and seemingly not reacting to the speaker. You can see that Fiennes’s Richard is constantly thinking, whatever is being said the wheels are turning in his mind and his blood is boiling, and some of the other characters need to give more thought to how they feel about what’s being said and what it means for them. This would help to differentiate some of the secondary roles and give greater nuance to the shifting factions of the court. Not much has been cut and with a first half coming in at 1 hour, 45 minutes, the show feels a little sluggish at first and there are a number of scenes in which various men sit around a table politicking so perhaps there’s scope to inject some dynamism in the staging. More thought too could be given to the role of the women to whom Shakespeare has given considerable focus but are not yet being used to make a forceful point either about the consequences of warfare in this period or as the only people able to see through Richard’s veneer of politeness. It’s a rare treat to see Vanessa Redgrave on stage (as Queen Margaret, the widow of Henry VI) and she delivers her lines beautifully but it’s not yet clear where the character is pitched – is she mad or do the others only think so? Likewise Joanna Vanderham’s Lady Anne has a single shouty pitch which isn’t capturing the pawn-like nature of the character or the lot of marryable highborn women to be treated like possessions. Phoebe Fox in the recent BBC version was a moving Lady Anne, while Kristin Scott Thomas in the McKellen film played her as a deadeyed drug addict detached from it all, so Vanderham needs to find an angle. Scott Thomas was actually in the audience and would be a good shout for the yet unannounced role as Cleopatra opposite Fiennes in the National’s forthcoming Anthony and Cleopatra. Finally there are a couple of themes that are hinted at but never fully realised. Lord Hastings (an excellent James Garnon) is the only person with a mobile phone which he uses to impart news, but this device isn’t utilised (and could be) in other places. If the director, Rupert Goold, is making the point that only Hastings is engaged in this way then we need the other characters to respond to that, or having other people bored and texting may add to the big scenes which currently lack reaction. And while I like the car park opener there’s only a hinted return to that at the very end which feels a little incomplete as a comment on modern engagement, maybe we need to see the bones again or have some kind of re-interment to close the story. Regardless of these small changes, this production of Richard III is fascinating, powerful and compelling. With a reawakened interest in this period of history, audiences are coming to this play with greater knowledge of the story and looking for an intelligent approach to one of Shakespeare’s darkest works. Fiennes is the life-blood of this production, creating a loathsome, terrifying and engaging villain who easily outmanoeuvres those around him and keeps the audience on the edge of their seat throughout. As an exploration in human morality Fiennes’s recent roles have taken us from a bachelor afraid of marriage to an emotionally damaged man avenging himself on the world, reminding us what a truly powerful performer he is. Richard III is at The Almeida Theatre until 6 August. The show has some seats available from £10 but day seats are available from 11am at the box office or via lottery. There will also be the first live screening from The Almeida to cinemas on 21 July.